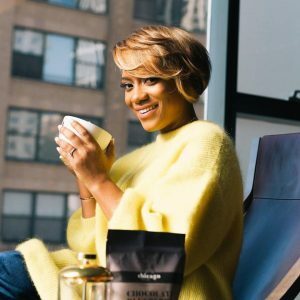 Former Wall Street Analyst turned Serial Entrepreneur, Kris D. Williams always wondered why she couldn’t find a strong cup of sweet and flavorful coffee. Each morning on her way to work, she diluted bold coffee roasts with extra sugars and creamers. As she searched for a natural sweetener to enhance her bitter cup, a light bulb went off when she decided to grind her coffee with dried fruits, chocolate and nuts. Using her beloved French Press, Kris found that the aromatic and delicious brew produced was a solution not only for herself but for coffee enthusiasts everywhere. Today, Chicago French Press (CFP) fuels the mornings of other go-getters and high-achievers who desire a good cup of Joe. Freshly-roasted, organic coffee made in Chicago, Illinois, each CFP batch is single-origin, custom-roasted organic coffee flavored by hand. Their story is about more than just selling good coffee; it’s about doing good work. Today, CFP is a coffee company committed to empowering communities across the United States. CFP donates a portion of sales from each bag sold to raise awareness and support local and national programs for people in need. Visit chicagofrenchpress.com for a full list of their charitable partners and causes.